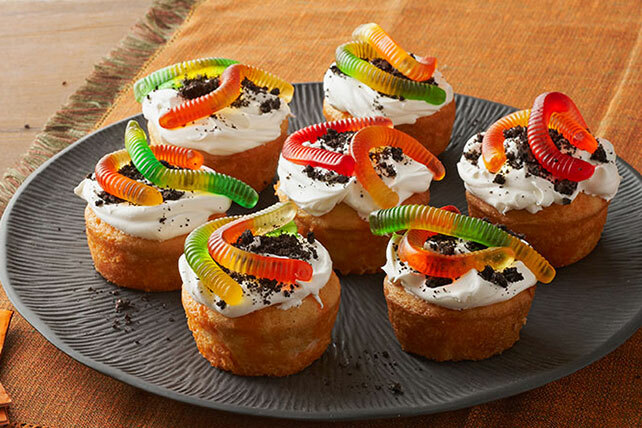 Kids like dirt and worms whether or not it's Halloween—and more so when they're fashioned from chocolate cookies and fruit snacks and served on cupcakes! Place cupcakes in muffin pan cups. Use large fork to pierce holes at 1/4-inch intervals in tops of cupcakes. Add boiling water to gelatin mix; stir 2 min. until completely dissolved. Drizzle over cupcakes with small spoon. Refrigerate 3 hours or until gelatin is firm. When ready to serve, dip bottom of muffin pan in warm water 10 sec. ; unmold onto serving plate. Frost with COOL WHIP. Garnish with remaining ingredients. Gelatin-filled cupcakes can be made in advance. Freeze in airtight container up to 1 week. Thaw in refrigerator overnight, then frost with COOL WHIP and garnish just before serving.